At first, CNBLUE’s Blue Moon concert at the Pasadena Civic Auditorium in Los Angeles looked like any other K-pop shindig. Hordes of fans streamed into venue, and the crowd surrounding the merchandise table resembled an amorphous blob rather than an organized line. Fans passed out signs to hold up during the concert, and the girl to my left offered me lightsticks. When the Blue Moon video kicked off the night on the ever-present jumbo screen, I settled in for what was sure to be an enjoyable, yet familiar, K-pop concert. And then CNBLUE took the stage and all that changed. It has been a week since the band graced L.A. with their presence, yet I am still buzzing from the experience. In 2012, CNBLUE came to L.A. for a joint concert with FT Island, and impressed our writers, despite a shorter set. Fast forward to 2013, and they’ve got their own world tour and full two and a half hours onstage. As far as K-pop “world tours” go, Blue Moon was pretty sizable. After stopping in numerous Asian countries and Australia, the band started the 2014 leg with New York and L.A., and recently finished the tour in Mexico, Peru, and Chile. The thing that struck me the most about the show was how different it is to listen to CNBLUE live. I have been to a good amount of K-pop concerts, with all the remixes, special stages, and bedazzled costumes, but CNBLUE blew me away without the pyrotechnics. The concert was downright subtle in terms of visuals, comparatively speaking, but it packed a punch in terms of sheer performance quality. Due to restrictions on music shows and the pre-recorded nature of MVs, when watching an idol band on screen there is always the sense they are “faking it,” even though everyone knows they play live. CNBLUE did manage to play live during their last promotion cycle — a victory for sure — but there were still restrictions regarding movement, camera angles, timing, etc. All of those went away at the concert, and the audience got dynamic songs, with extended guitar and drum solos, and the band demonstrated an impressive musical prowess. The set started off strong and fast with songs like “Where You Are,” “Naran Namja,” and “Coffee Shop.” From this first part, a personal favorite was “Wake Up,” where the band showed off all their rock chops and got the crowd pumped up. It was fun to see the distinct physicality each of the members had when playing, which showed how much they were into the music. Yonghwa was all over the stage, charisma tumbling out him. He had the unique ability to give attention to each section of the audience, while still remaining intimate. It probably helped that the venue felt cozier, and Yonghwa clearly thrives in the kind of environment that allows him to interact on a personal level. Jungshin was all over the stage as well, but in a meandering, cool way, with his expressive hands on the bass drawing focus. Jonghyun anchored both of them by mostly staying in place, and despite some issues with his foot pedals at the start, it was apparent how technically precise he is as a guitarist, and how prominent his parts are in the music. Minhyuk also impressed by playing the show pretty much straight through, without ever losing his ease and playfulness on the drums. CNBLUE ended the concert with a bang after another round fast songs, including their recent hit “I’m Sorry,” and then did favorites like “Love Girl,” “Love,” and “Try Again, Smile Again,” for their encore. 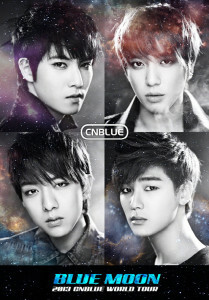 Aside from their professionalism and skill, CNBLUE connected with the audience in a down-to-earth way. The boys spoke in English the whole time, and though undoubtedly scripted, it was a sincere effort and the audience loved it. Even the short sentences, like Jungshin asking, “Are you having fun?” then pointing to himself and saying, “Me too. Me too,” created a fun atmosphere and made it feel like they honestly enjoyed being with their fans. One assumes that the boys had major jet lag the whole time, but it didn’t show it at all, and they communicated with the audience both vocally and through lots of pointing, smiling, and hand-touching. At the end, they picked up all the fan gifts thrown onstage, and Yonghwa even adorned himself with them. While all of this audience interaction probably comes from years of practiced fanservice, it didn’t feel disingenuous, but rather comfortable and happy. CNBLUE has a reputation for having it all — they’re idols with musical talent, good looks, acting chops, variety skills, and an admirable philanthropic project. They’ve already got fans from all over the world, and this tour undoubtedly helped them snag more, and maybe it will propel them even further into stardom. But at the end of the way-too-short evening, I saw them as just a band who is great at playing music, and who loves their fans. Readers, did you go to any of the concerts on the Blue Moon tour? What did you think?